Amenities: 24 hour concierge, entertainment room, lap pool, spa, gym, steam room and sauna. Plus a 3,200 square foot 7th floor terrace with outdoor fireplace lounge and barbecue area, several large TV screens, full indoor kitchen and seating area. Next door to "Park at the Park" within the Petco Park baseball stadium grounds. Park at the Park is the grassy park area behind center field for pets and children to play. It open to the public except during ball games when its access is limited to ticket holders for the game. Other: There are 11 condos per floor on floors 2-6, eight on floors 7-18, six on floors 19 & 20 and four condos on the top three floors 21-23. Views into infield of the ballpark start around $800K for 1,100 sq.ft. Most floor plans here tend to run a little small compared to a lot of other high rise buildings. This is a great second home choice. A lot of lower level two bedroom units only have one parking space in the garage. Like the most: The Legend condo residents conveyed to me they love the 7th floor social lounge which is worth enjoying regardless of whether or not a ball game is being played in the stadium. 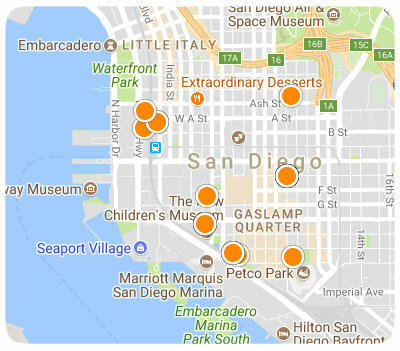 Residents love the location close to all the action of the Gaslamp and restaurants throughout the East Village. Praise was also given to the security of the building. The Legend condos have a person in the lobby 24/7 and a roaming security guard. Some commented that the residents are all very nice and that the building is maintained very well and its always spotless. Like the least: Some Legend condo owners said it can be challenging to enter and exit by car during ball games. Other comments: A wonderful place to live, with all the amenities you can take a vacation without leaving the building and adjacent park. This building is great for dogs being so close to the Park at Petco Park.